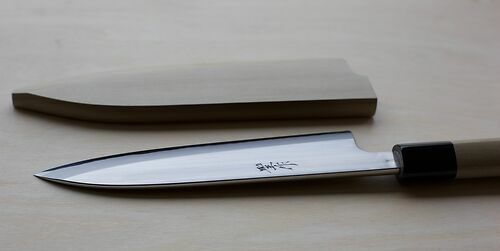 The single bevelled Mioroshi is a lighter weight filleting knife, lying somewhere between the heavier Deba and the more slender Yanagiba. Although the blade is not as thick as a Deba's, it is still substantial and will deal with medium-boned fish, but is also delicate enough for slicing and portioning - A great all-round knife. Masashi hand forges these himself in his workshop in Sanjo, Niigata. He hand laminates the shirogami white paper steel to the softer steel jigane cladding, and attends to every detail himself. Masashi trained under his uncle Yoshida-san at Yoshikane knives. Niwaki Tip: Although this is a heavier weight knife, it is NOT suitable for cutting through meat bones.